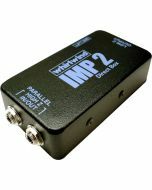 The Whirlwind pcDI is perfect for interfacing the outputs of CD players, laptops, iPods, etc. with professional equipment. This unit contains two separate DIs - input your signals with one 3.5mm (1/8") mini TRS stereo jack or two sets of color coded RCA phono type input and through jacks. Output is via corresponding color coded XLRs.